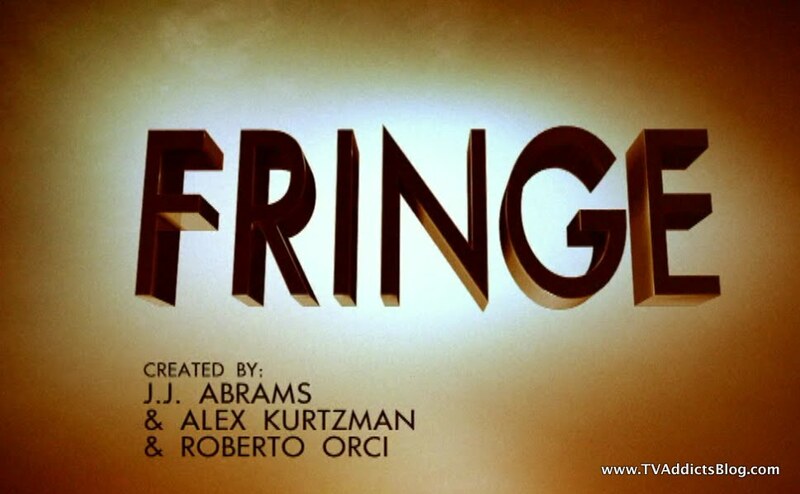 Hello Fringe fandom! Episodes like last night are the reason the frustrated fans stick around. The payoffs! Yes, we are still surrounded by total confusion, but we definitely got an awesome moment of television. And some very interesting new tidbits of this new "Peter-less" reality. All I have to say is WOW! Fringe has brought it and raised the bar once again. Bravo! We'll have a break for a week due to the World Series before the next episode so it's good that this one has left us with much to talk about! No sense in delaying, let's get to it!! It's tough to break this episode out into our usual categories this week, but we'll give it a shot anyway! This case revisited one of our favorite Fringe past-times. The Cortexiphan trials! 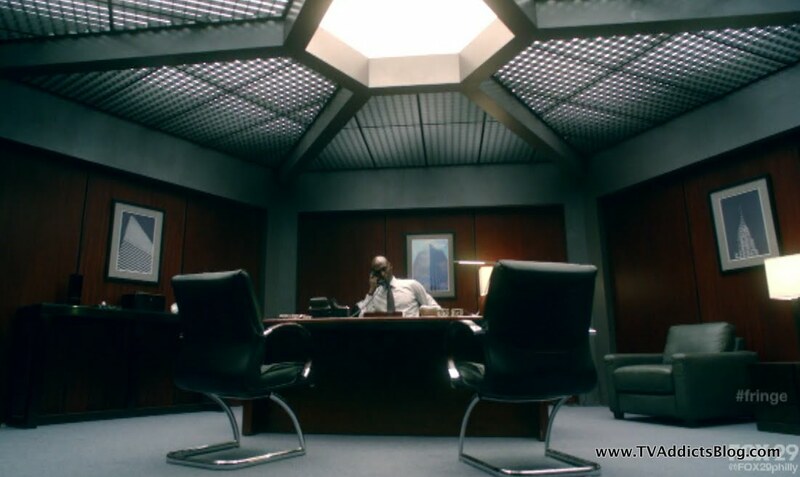 In all of the discussions throughout the episode, slight differences seem to be noted about how these trials went down and how Walter and William Bell's histories were altered as well. But we'll get to all of that. 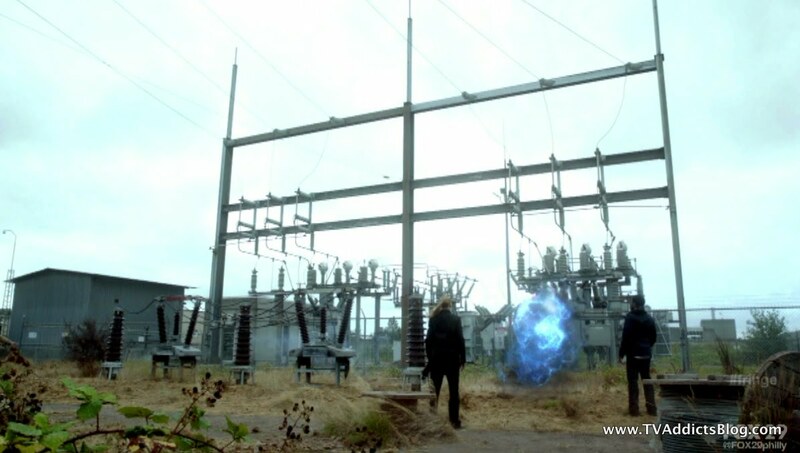 The case here was around some ominous blue field of energy that kept attacking Olivia. I'm not sure if it was really supposed to be a secret to what this energy really was, but I just assumed from the first time saw it. But I'll build the suspense anyway! 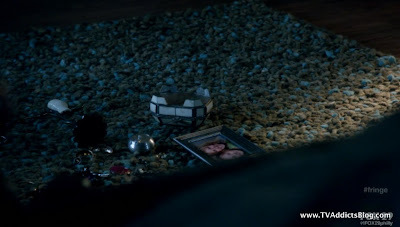 In the first scene, Olivia is sleeping right before 6:00AM and metal objects start moving towards one central place in her room. Then the blue force appears. 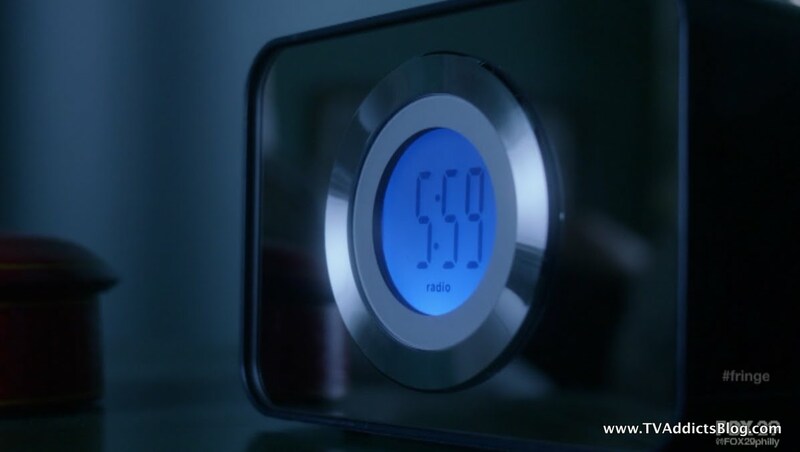 The clock turns to 6 and her alarm wakes her. The blue force touched her, burning her arm and then it vanished. And of course, that wasn't enough. 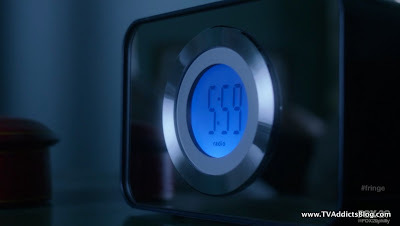 We then see the clock turn 6:00AM again. Oh great, shifts in time!! That's what we need to make sense of all of this. 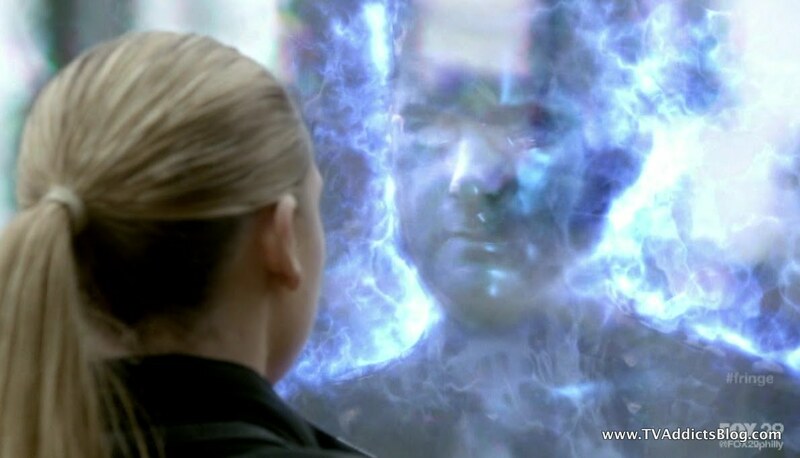 Olivia informs Walter of the strange case of blue energy. They send Astrid with her "Walt" Cam attached to investigate with Olivia. The blue field ends up going after Olivia again in the bathroom with metal objects flying about. Astrid runs after her trying to get through. 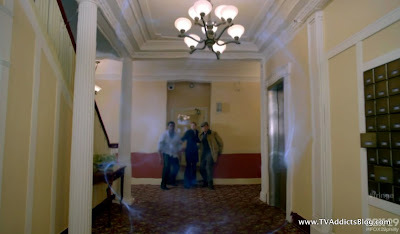 But the strange part again is that Walter sees and hears it all happen before it actually happened. Some kind of time distortion. 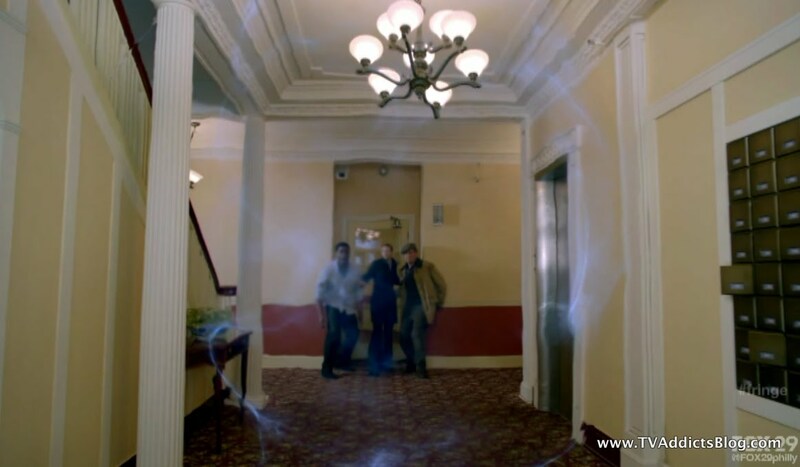 Olivia and Astrid (with Walt Cam) head to Massive Dynamic to dig up the case file on Subject 9. (MD differences to be discussed in the Mythology section). They discover that his name is Cameron James. I'm not even going to pretend that this isn't a nod to acclaimed director of The Abyss, Terminators 1 and 2, Titanic and Avatar; Mr. James Cameron. I'm not sure if the reference is intended to reflect ideas that he has had in his movies. I guess the closest comparison would be the energy field created when the Terminators time traveled back in time and arrived all naked and stuff. But...we'll get there! 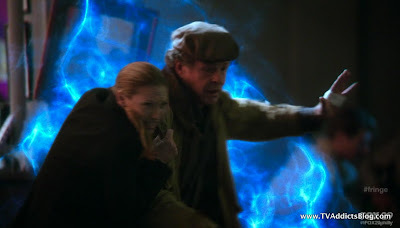 Walter insists on going on the hunt to find Subject 9 with Olivia. There are additional reasons for this since he hasn't left the lab in 3 years, but we'll get to that in the mythology section. Olivia agrees to the tag-a-long. 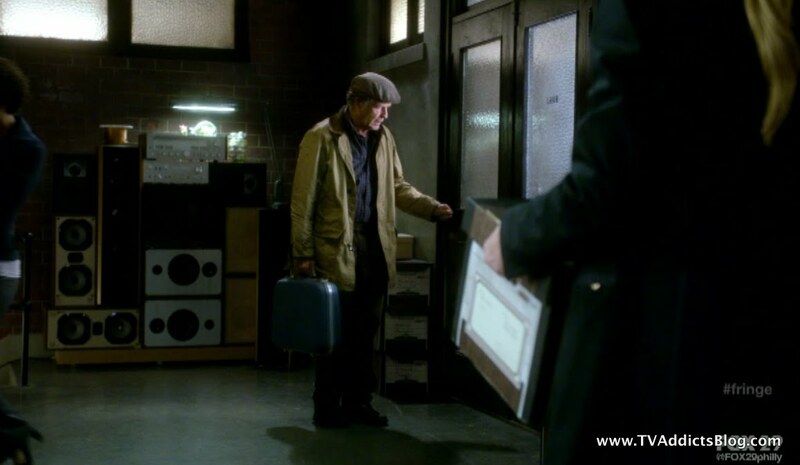 Walter and Olivia track down Cameron's apartment and do not find him. Though they do find a land lady and envelopes addressed to Mark Little. The lady said that Mr. Little is a truck driver and should return the next morning. So Walter and Olivia take this opportunity to paint the town red! 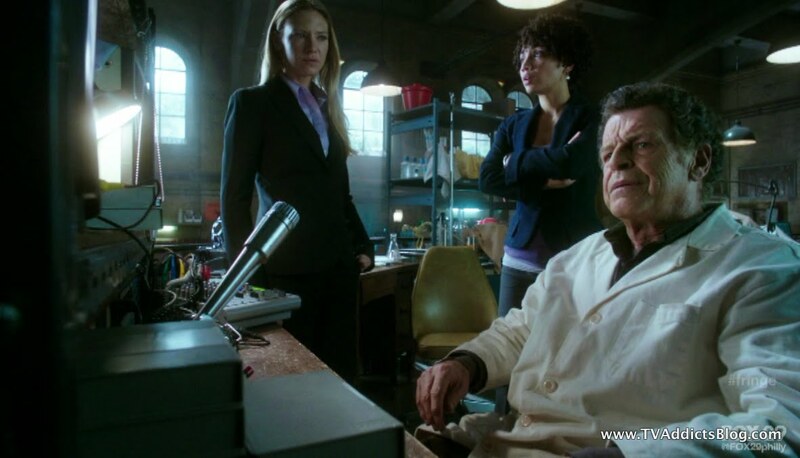 You know, in 4 seasons of Fringe, this is probably the first time that we've seen Walter and Olivia interact this much on a case together. Peter usually was in the nurturer position when it came to Walter. But, not Olivia has had to take on that role. Walter and Olivia check into their hotel rooms but Walter has a bit of a case of misophobia (fear of germs) which hasn't happened to him in years. Olivia decides to take the crazy genius out for some root beer floats. And it's time for attack of the killer blue force again! Spoons and stuff flying all over the place, Olivia shoots the window and gets Walter through it. 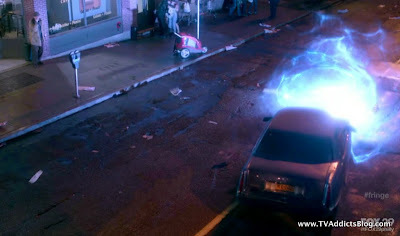 A car ran right into the blue force and stopped dead. Early the next morning Lt. Daniels from another FBI division comes to investigate the case. (had to be a reference to Lance "Broyles" Reddick's character on The Wire, right?) 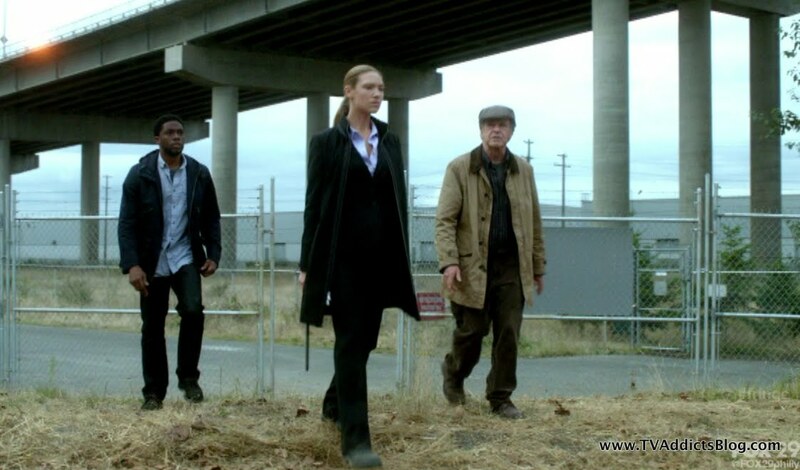 Olivia provides her clearance to investigate the case and then she and Walter rush off to Mark Little's apartment. 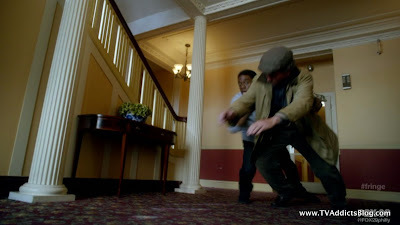 When Mark Little realizes the FBI is searching for Cameron James he makes a run for it. Walter just minding his own business downstairs accidentally gets in Mark's way and stops him from getting away. 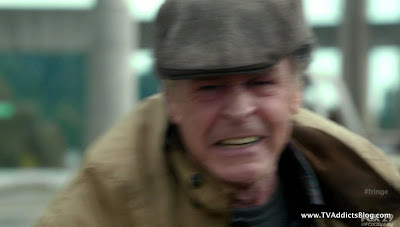 Once Mark realizes that he's being chased by Olive and Walter his fear turns into anger at Walter (naturally) and a bit of excitement to see Olivia again. He mentions that Cameron James was his father. They used that name to sign Mark up for the trials. He then accessed his son's trust fund and spent it all on drugs. 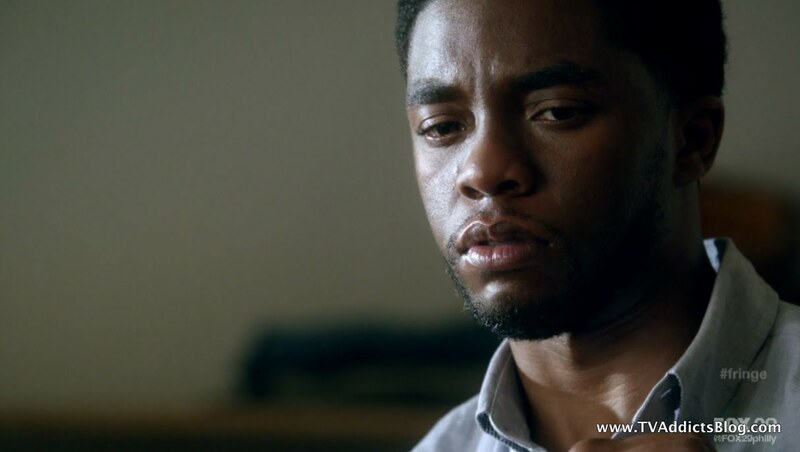 Mark complains that his life has been ruined by Walter. He doesn't even have any special powers, just weird side effects. He sends metal flying when he's mad. One time he pulled fillings out of a date of his because he realized he said something stupid. 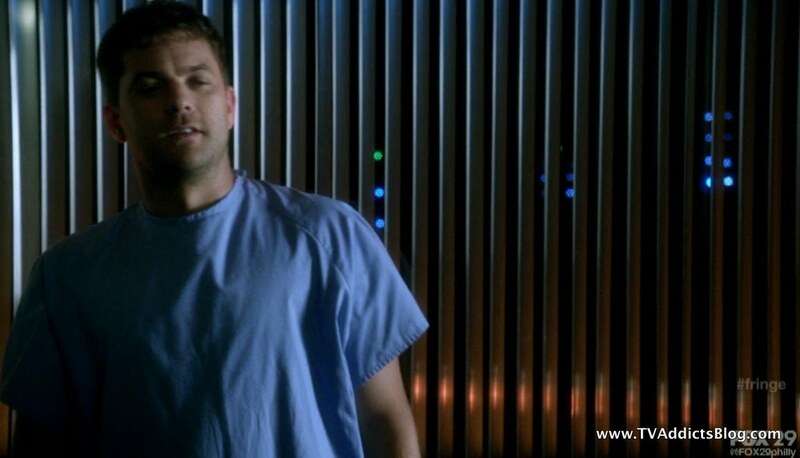 And Mark insists that the blue field chasing Olivia is definitely not him. And when the blue field returns to them in that instant, Mark negates its power and stops it. 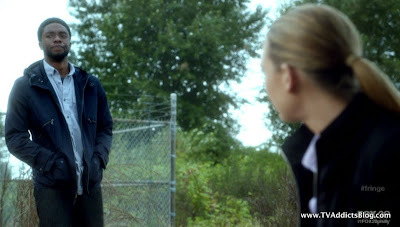 Mark suggests that maybe Olivia is causing the field. When he first started getting his "side effects" he thought they were coming for him too. Walter is considering the facts of everything they've seen and thinks that electromagnetism is NOT the root cause. The time distortion is affecting existing magnetic fields. He thinks they need another field of energy to neutralize it. 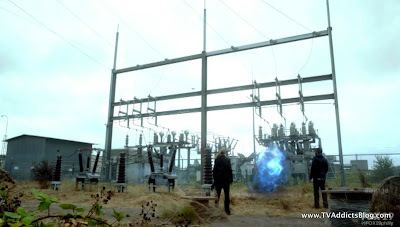 They decide to bring Mark to a power grid so that he could tap into that energy and use it against the blue force. So, case closed, it would seem! Mark's final request of Olivia was to make Walter forget about him. I guess this was a nod to the fact that everyone does not remember Peter. This whole case was very integral to advancing the mythology of the show. So it's time to get into that! Walter's Theory on "The Man in the Mirror"
When we first see Walter in this episode, he has 28 cameras aligned in a circle for one helluva experiment. 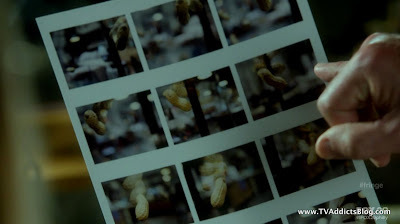 He throws a peanut in the air and triggers all cameras to snap a picture at all angle. 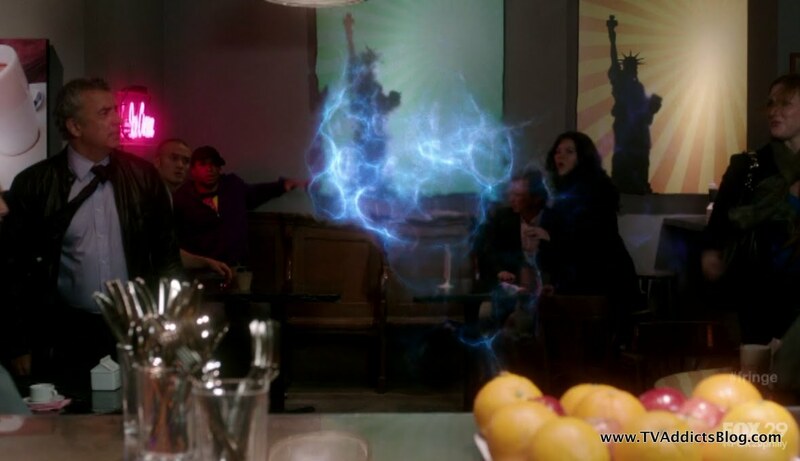 He believes that the man he and Olivia are seeing (Peter) is "out of phase" with their reality and only visible from a certain angle. He is hoping that one of the photos that he eventually takes will capture Peter in it. 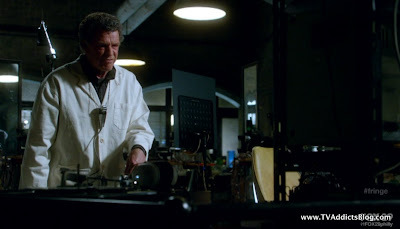 He even calls in to Astrid to check on his experiment as they're investigating Mark Little. 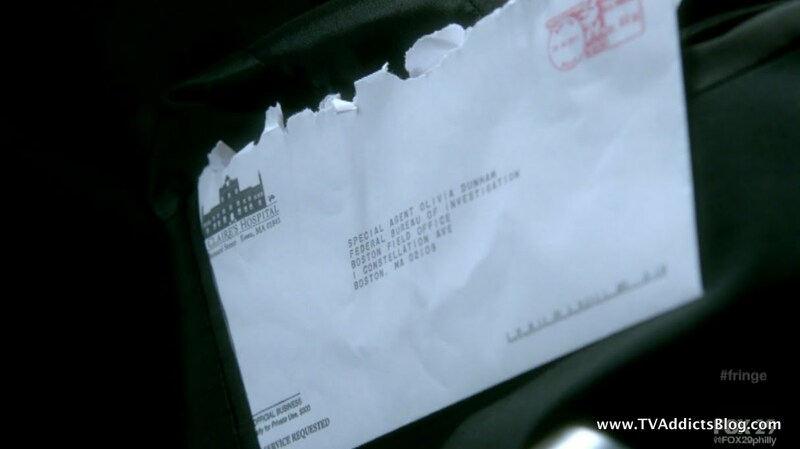 As a follow-up from Dr. Sumner's visit last week, Walter found an envelope in Olivia's jacket with the St. Claire's logo. Sumner is recommending returning Walter to the hospital for further evaluation. Olivia needs to indicate if she agrees or not. This triggers Walter's need to head out on the case with Olivia. 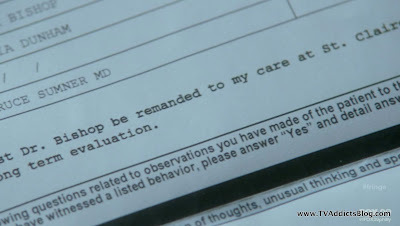 After Walter's confrontation with all of the germs in his hospital room, he then confronts Olivia about the letter that he saw when he was "snooping". "Does he pose a significant threat to others?" was one of the questions on the form. Olivia says whatever she decides will be for whatever is best. 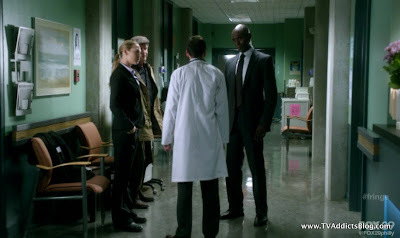 After Olivia fires that gunshot in the air, Walter accuses Olivia of being reckless and behaving irrationally. Olivia agrees that she did. Walter stated that people think he's crazy when he does that. "Crazy is a lot more complicated than people think." Whether it was that final confrontation with Olivia or not, she did check off that Walter does not need to return to St. Claire's. Maybe he and Olivia are already starting to form that familial bond. Now, I usually save all of the differences in this new timeline for the next section, but there are several with Massive Dynamic I thought I'd get into it here. We first see Nina Sharp discussing nanotechnology with her constituents. 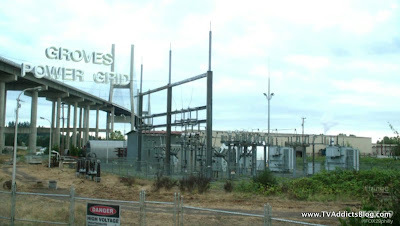 Basically how it is perceived as dangerous but it is not Massive Dynamic's concern. They own the patents but they don't have to worry about what people do with the technology. I never got warm fuzzy feelings from MD in the past, but this Nina Sharp seems a lot shrewder of a business woman. Walter clearly has animosity for Nina Sharp that seemed to be non-existent in the original timeline at this point. And it would seem like Nina Sharp is calling the shots at Massive Dynamic all by herself. If William Bell is indeed dead in this timeline, maybe he didn't leave the company to Walter in his will? Perhaps Nina was the Yoko Ono that "broke up the band" of Bishop and Bell? Walter went as far as calling Nina a VIPER and provided for a hysterical scene. "Walter has said many things to me over the years but 'Thank You' was never one of them"
Nina seems to have a closer bond with Olivia than in the original timeline as well. When Olivia explained the Fringe event to her, Nina got the feeling that something was left out of the story. That the event was happening to Olivia herself. Nina said that she hasn't seen her be this afraid since Bobby Hastings asked her to the prom. Ummmm Nina has known Olivia since at least High School!?!?! WHAAAT? I think Nina knew OF Olivia in the original timeline but it seems like she has been very involved in her life in this revised one. I'm really hoping we get a revised flashback scene to show exactly what was different back then. So, I had mentioned that something happened when Olivia fired that gunshot into the air, right? Well, the blue force vanished from the New York power grid they were at. 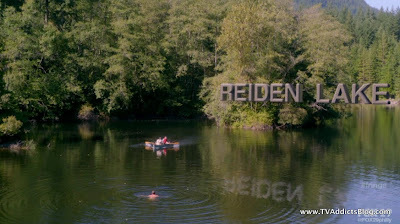 But at Reiden Lake, the site of so much Fringe history now including Peter's drowning and death, Peter arrives out of the lake surprising 2 people fishing! He's back!!! And he was observed. Time distortion, an energy field, Cameron James and Peter arriving from nowhere naked? Yeah, has to be a Terminator reference, right? It isn't long before the whole Fringe team has been made aware of Peter's arrival. Broyles calls Olivia saying that this man claims to know all of them and wants to speak to Olivia Dunham. 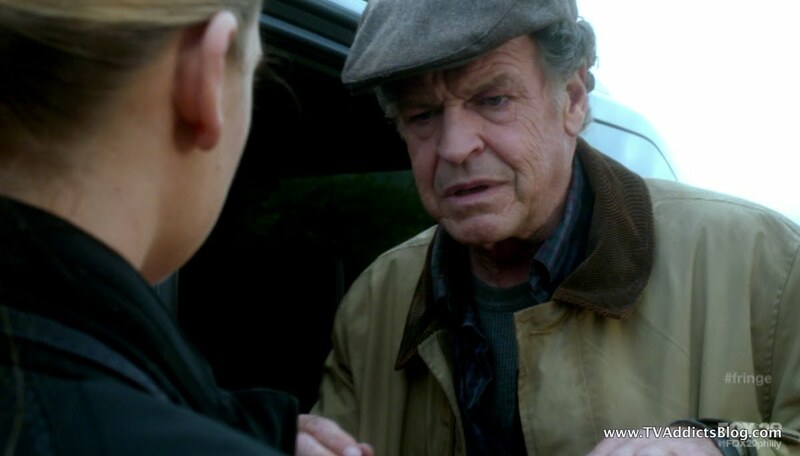 Olivia has never heard of Reiden Lake before (more on that later) but Walter recalls having a house there once. Olivia and Walter arrive at the hospital and Olivia goes into to see this mystery man. Peter turns around and sees the woman he loves, "Olivia, thank God you're here!" And Olivia responds just as we feared she would, "Who are you?" To Be Continued in 2 weeks! He's back! Finally! I know it's only been been 4 episodes but it feels like forever. As we suspected, Peter remembers everything and the rest of the Fringe team remembers nothing. There wasn't a sudden rush of memories to the entire world to reinsert Peter. So, how is this all going to play out? I don't know but I like the idea of Peter having to reconnect to all of these characters and him having the memories of the past 3 years as well as that one possible future. After an initial focus on Peter's arrival, the show can probably now shift more to the 2 sides working together as well as facing this new shape shifter threat and whoever is causing it. I'm looking forward to it! We're not done yet though folks. More stuff to get into. Glyph Code - RESET - Well, the timeline is definitely reset this year. Peter is there now and no one remembers him. It's like a fresh start for everyone. Should be interesting! Thanks to Fringepedia as always for the screen cap. Observer Spotted! - He witnessed the resurrected Peter at Reiden Lake. It didn't really look like September either, the sympathetic observer to the Bishop Boys. Something tells me we'll be hearing more from this guys soon. "When he shows up again, I will have maximized the changes of capturing him him film. 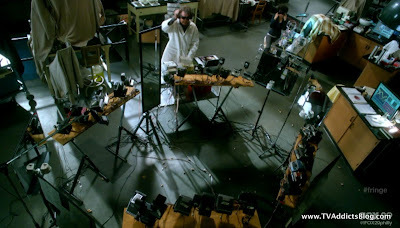 An idea, I got from the fight sequences in the Matrix" referring to the whole circle of cameras experiment. Walter's reaction to being out of the lab and getting smoke blown in his face in New York was classic! "Fresh Air!! I should have gotten out of the lab years ago!" The funniest part is that he was totally serious! "Claire, will you please man the cameras in my absence?" Astrid's response: "That doesn't even start with an A!" "If you don't mind, I think I should urinate before we leave. And don't worry, I packed us sandwiches." Never gets old! "I can't imagine what I'd see with a black light or worse, I CAN imagine!" In reference to the "germ filled petri dish" of a hotel room he'll be staying in. "Her voice goes right into my inner ear and rattles around like razor blades! Of course I heard her...tell her to go F......" We can only guess what he was about to say next but Astrid responds to Nina with a simple Thank You. Food of the Week - Sandwiches and Root Beer Floats! 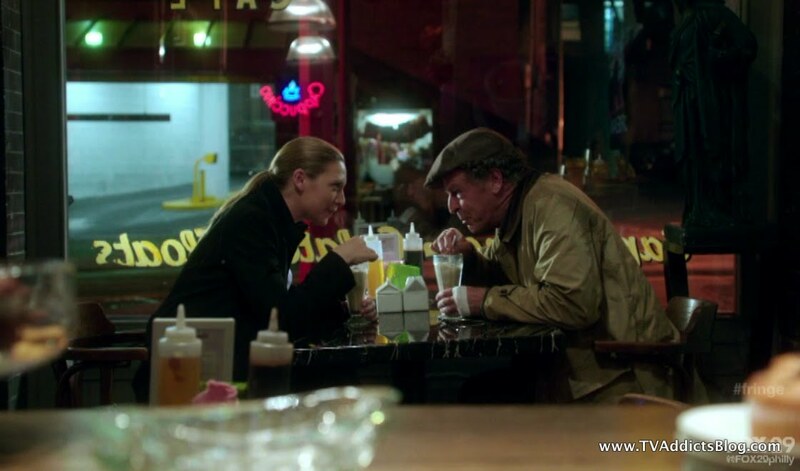 And Walter provides Olivia on directions of the best way to drink one to get a perfect balance of ice cream and soda. So we mentioned the Massive Dynamic and Nina Sharp ones above but there's more to it. The Cortexiphan trials seemed to have gone down a little differently as well. Olivia explains the trials to Astrid (who wasn't aware of them yet. Difference!) and Walter and Bell had the same goals in mind. Unleash children's inner abilities before they are socialized out of them. But apparently, the doses they were given were supposed to be small enough that the abilities they portrayed were only temporary. Subject 9 had side effects but Olivia claimed to never have had side effects. Olivia also said she had not encountered any other cortexiphan subjects. We have been encountering them for 3 seasons in the original timeline! Perhaps without the need to try and cross back over to return Peter, Walter didn't intensify the study of crossing worlds or the children's ability? Walter referred to Olivia as the strongest of the candidates. Olivia spoke with ease of setting fire to a room as a child. Perhaps without the fear of her step-father in her life she embraced the cortexiphan studies? We don't know exactly WHEN in her life she killed the step-father though. The way the studies ended seems to be different too. Olivia ran away from the studies. Walter told Olivia later that he and Bell shut it down years later. 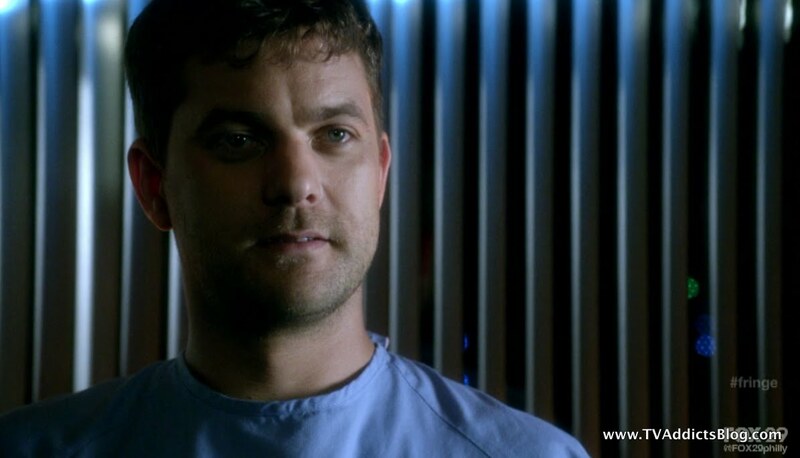 Mark Little explains that Olivia wasn't there when the experiments stopped. But Walter was not happy about it and possibly can't be trusted. Maybe Bell shut it down? 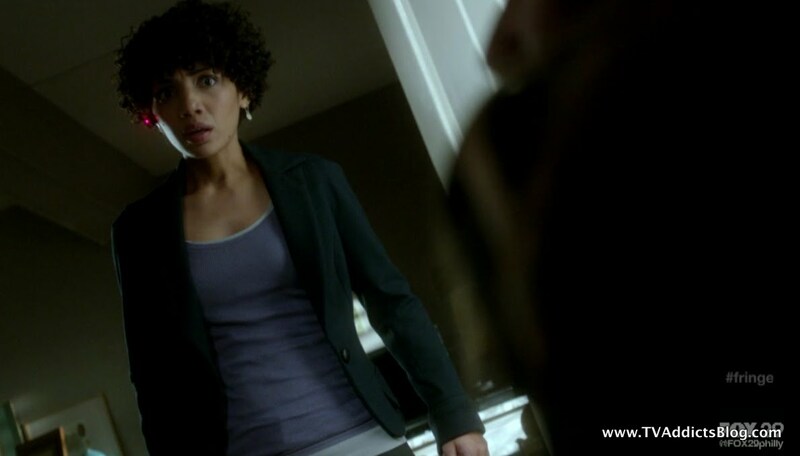 Or Nina shut it down causing Walter to be so angry at her? I don't know, but it seems important enough since it was brought up. 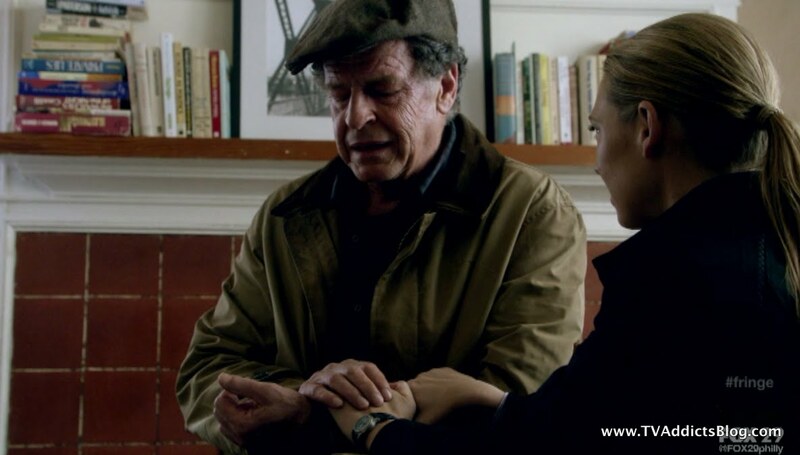 Walter also mentioned that his wife Elizabeth killed herself after the loss of Peter. It sounds like he said "after OUR Peter died." But it may have been "after HOW Peter died." Elizabeth originally killed herself because she couldn't live with the lie of having the Peter from the other side. But in this timeline both Peters died. I'm sure she wouldn't be able to live with the guilt of that either. But, she never would have met the Peter we know since he drowned at Reiden Lake. Also weird that Olivia didn't know about Elizabeth killing herself. I'm pretty sure she knew about it before. 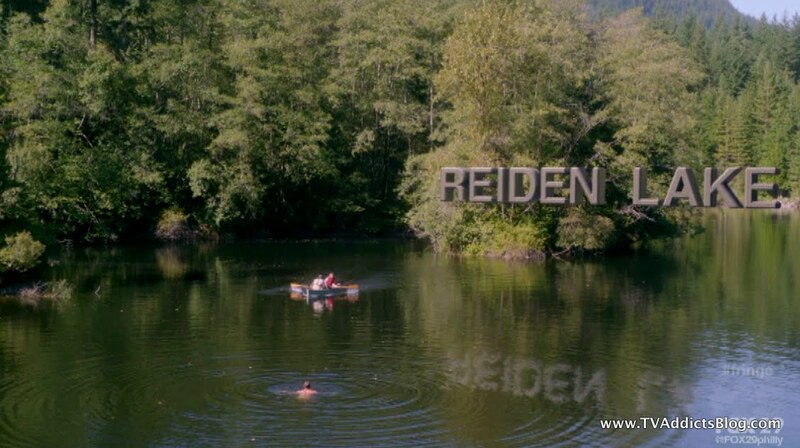 Speaking of Reiden Lake, how does Olivia not know where that is? 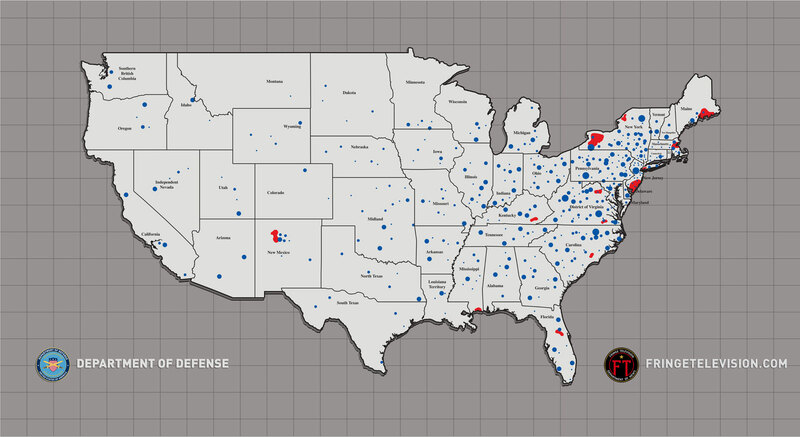 Surely, it's still the site of the big incident in the Red-Verse since it's where Walter crossed over. And Olivia spent time over there as well. Why wouldn't they be very familiar with that location? So here we go with some time-altering issues again. 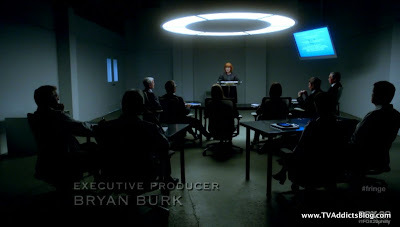 If the Fringe team hasn't been investigating cortexiphan subjects how did Olivia originally cross sides to become captured by Walternate? 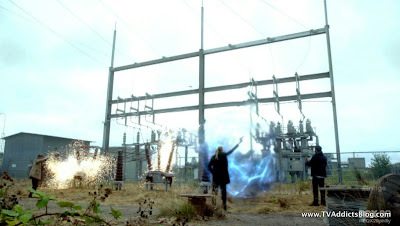 They used a bunch of cortexiphan subjects to join power and cross worlds to rescue Peter, thereby getting Olivia captured. Walter went with them as well and then William Bell helped them cross back. Walter definitely wouldn't have gone this time since he hasn't left the lab in 3 years. And since Peter and Walter didn't have to travel back to this world with Fauxlivia, does that mean William Bell didn't even die? Or was he already dead for some other reason? Did Walternate cross over to this world to kidnap Olivia instead of Peter? 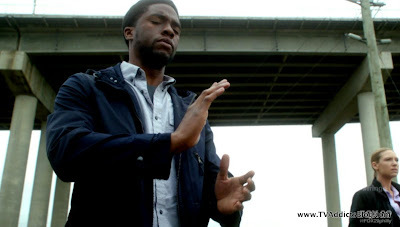 And of course, if Peter didn't exist how did that darned bridge get created? Was the machine created now for the Olivias to use instead? I really hope we get some more information thrown in. And, they've been doing a good job at slowly revealing the new history so I'm sure we'll get more. One thing is for sure, there definitely seems to be MORE differences than we had originally anticipated. A lot is still the same though. The Matrix was still made without Peter being alive, after all! But, it seems like more characters with direct connections to Peter may have been impacted. Can't wait to find out what else! That's all I have for this week folks! It was a great episode and we have 2 weeks to discuss it until the next exciting episode with Peter back. In the meantime, The Walking Dead and Terra Nova will still be recapped. There is additional information in the end credits with how you can catch up on the 6 episode 1st season of Walking Dead prior to Sunday 10/16's season 2 premiere! I highly recommend it. But for now, I hope you enjoyed my ramblings as always and I'll see you in a couple weeks! 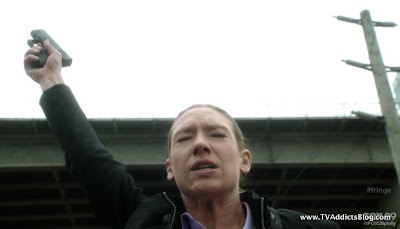 Wow, I'm so caught up now I am the first one to post on last night's episode! You could have knocked me over with a feather when Peter popped out of that water! So I guess he's going to have to make Olivia fall in love with him all over again (as in 50 First Dates?). I am anxious to see Walter's reaction when he sees Peter and finds out that it is his long-dead son! I too found myself thinking many times throughout the episode "I thought she knew that already" -- and the comment Nina made about Olivia's prom -- so I agree, I think we are going to see an entirely different timeline of events. I hope it isn't TOO confusing! I can't believe we have to wait two weeks til the next episode, and I have already sent back all my Netflix DVDs! Guess I'll just have to rewatch what I have on the DVR to keep up with my new Fringe addiction! 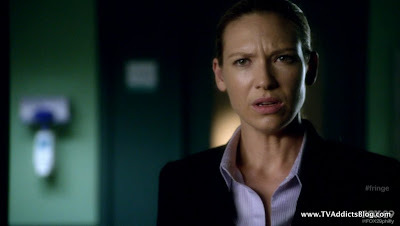 @Cajun, congrats on the huge effort to catch up on Fringe. I'm very proud! lol But yeah, if you're watching the show on Friday night and ready to comment on Saturdays, you'll probably ALWAYS be the first comment. lol It seems like most people check the blog out when they get to work on Monday. But, the earlier the better to start discussing! My wife nearly fell off the couch when Peter popped out of the water. I had never seen her so excited. lol But yeah, it would seem that we're going to see that true love can never be destroyed by different circumstances. I would think that Peter and Olivia will connect yet again. As well as Peter and Walter. I still wonder if we will ever return to the original timeline.....if these characters will regain their memories. It will definitely be interesting to see Walter's reaction to Peter. I'm guessing they'll have to do some DNA testing to prove that this guy is who he says he is. Should be exciting! Yeah...the changed timeline. This is the first time where I was thinking that things were totally off. The first few episodes it was only a line or 2 here and there that seemed different. But they haven't been investigating cortexiphan patients?? 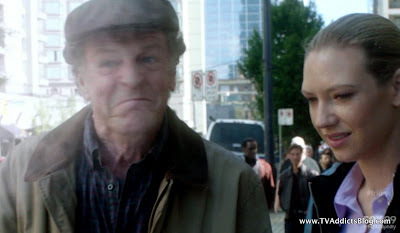 Walter and Nina have a rift between them 3 years after the Fringe Division was formed? The cortexiphan patients are not displaying symptoms? Stuff is definitely a little different now. My wife just recently picked up Fringe Season 3 on Blu for me so looks like I have another re-watch ahead of me! lol Your next assignment should be to catch up on The Walking Dead which resumes season 2 tonight!! lol They are airing a marathon of season 1 today starting at 2:30/1:30 (central). Season 1 is 6 eps. It's also streaming on Netflix. There is a lot of gore, but it's an awesome show. No problem for the recap. Thanks for catching up and for reading! Hmm, Cajun, I think I forgot that you are already up on The Walking Dead! lol I just saw you're on my distribution list. 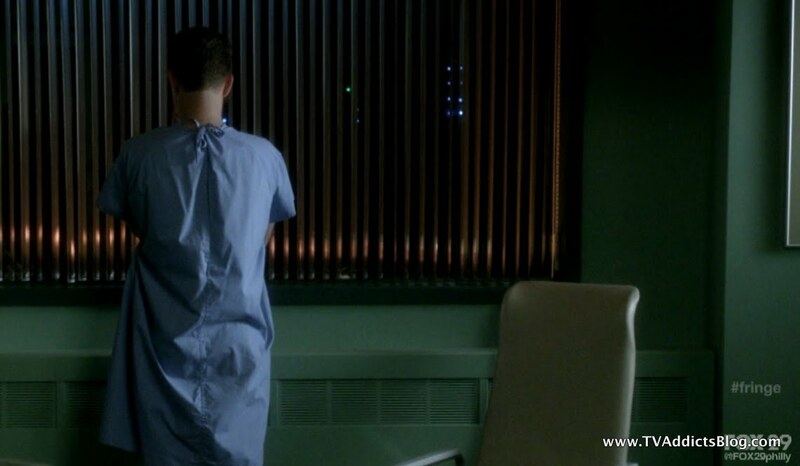 :) Awesome ep tonight!! I'll be doing my brief recap tomorrow sometime. I was extremely happy with that episode. I am glad they didn't draw out the "when will Peter be back" drama any longer since, we all had a pretty good idea he'd be back at some point. Why draw out the inevitable. It almost sound like Nina might have been Olivia's legal guardian at some point with the prom remark. We know her mother died in the previous time zone. We also know she killed her step father. Someone had to raise her. What an interesting concept of how they brought Peter back. Boy falls in lake... presumed dead... finally surfaces 30 years later. It looks like this new time line is definitely locked in now. There is no going back. Perhaps the differences between time lines will be revealed much faster now that Peter will be asking the same questions we have been. Thanks for props on the Yoko Ono theory. lol It's possible! Good point on Nina possibly being the guardian. Didn't even think that far into it, but that makes a lot of sense. Perhaps if Olivia was looked at as the "best" test subject they wanted to keep tabs on her. I still think a flashback of this altered past would make for a pretty awesome episode! Yeah...definitely cool that Peter appeared in the same place that he drowned. I wonder if they ever buried him or if Walter left him at the bottom of that lake. Probably looking into it too much there, but why would they bury him? People would be pretty confused since they already buried THEIR son. Yeah...I really don't see HOW they can go back to the original timeline. And maybe they don't have to. Since Peter has the knowledge of how things originally were...we still bring that forward. 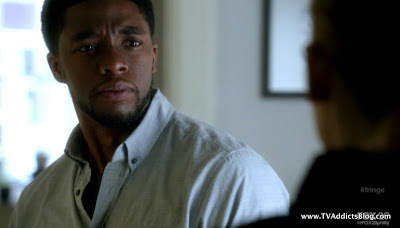 But it's still a shame to lose all of that history between the characters....and what about Henry Bishop/Dunham!?! Will Peter never learn that he had a child? Definitely interested to see how everything progresses. But yeah...I have full faith in these writers to keep producing a quality show. So onward to the next episode!! just gonna enjoy the ride and the the info as is when they give it. Cameron James was good fun, as was Walter trying to acclimate to the outside. patient but it's time for that pay off I think. The Claire bit was classic ! Good for Astrid. Was very cool that Peter came back thru the lake. Great idea by the writers. I was NOT happy to hear that we have no new ep next week. UGH! Heard SOA is getting a season 5 next year! Yay ! I'm caught up on Dexter and HIMYM if you've watched them and have anything to discuss. Oh definitely...I'm not going overboard with trying to figure things out either. 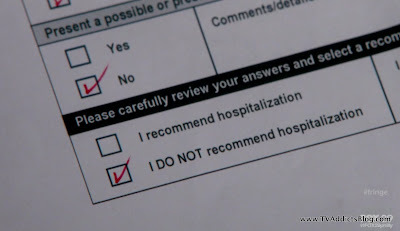 Fringe just isn't that kind of show...they give us the answers pretty quickly anyway! lol It's still an awesome ride though! And I do like to speculate about where it's heading. Yeah, I was originally thinking Nina would have both hands too....but I guess if Walter still went over to the other side to get Peter....Nina may still have intervened the same way...but maybe slightly different if she has neither hand now. lol The Prom thing is very bizarre....but as I mentioned...I have my theories on maybe how that went down...and Bill made some good comments too! You're not alone with the Observers/Watchers mythology. I definitely want more information there. Last season a few of us were thinking that they linked to the FIRST PEOPLE, which was all wrong since it was Future Walter/Peter/Astrid/Ella...lol But yeah...I really hope they do that. 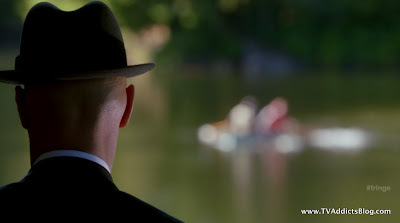 But I have this sneaky feeling that the Observers may just be part of this universe that will never be explained. I hope not though. They must have some desired outcome if they don't want Peter to exist...right? And the fact that September is defecting from them is very interesting too. Thanks for the link to the article. I think I saw it last week but must not have read it! Interesting stuff! How was Dexter without spoiling?? Looking forward to Once Upon a Time this Sunday. Will be great to have some LOST writers out in TV Land again! yeah - HIMYM was a good time. He's still wearing the duck tie ! It's so awesome how the keep that stuff going. Enjoying Kumar but hope he stops the whole 'no, I'mnot going to analyze you guys' somewhat qyickly - don't want to hear that every ep. Loved the baby reveal and the internet searches. I liked the chick too - wich she was hanging around. Seemed like they had some chemistry. Dexter - without spoiling all I will say is - it was great. And Dexter did something surprising. Lt. Deb is a hoot so far. I'm also looking forward to Once Upon a Time. Am promising myself not to judge too much on the first ep - feel it will be all set-up and not representative of where the show will go. Did not know about Sutter wanting 7 seasons but agree with you - unless the ratig really die I can't see them saying no. I can't wait tos ee what happens with the hit out on Tara. I love that he's still wearing the Duck tie. lol And I'm guessing he'll keep wearing it unless he comes up with a bet to get him ou of it! Yeah, I'm sure they won't have Kumar analyze them every week. I liked the girl that Ted was going to date also....You never know with this show...she might not be totally out of the picture yet. But it definitely seemed like she was. Yeah...I think i mentioned that TV Guide's Roush really turned around on the show after watching the 3rd episode. I never view pilot episodes as "the best" a show can do. It's always setup and the cast hasn't had a chance to get their chemistry going yet. I think the concept of the show plus the people attached give it a lot of potential. I'm looking forward to the LOST shout-outs alone in the pilot ep. Yeah...I'm not sure where I read about the 7 seasons so don't quote me on that. Could be just me reading fan comments. But I'm sure Sutter is very open about stuff like that on his blog and twitter feed! Scheduling Fringe for next week really has nothing to do with the World Series. 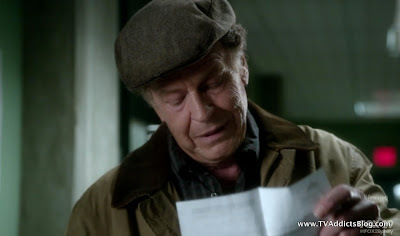 "November" Sweeps actually starts on 10/27 this year and this episode is sure to be a "very special" episode of Fringe with Peter's return and all. This was purely designed as a SWEEPS episode. And we need every bit of ratings magic we can get for this struggling show!